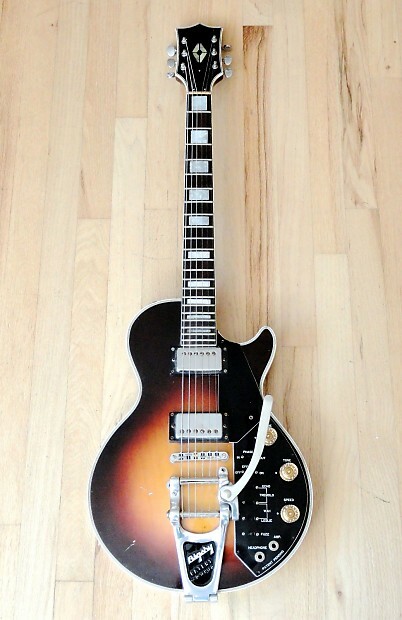 Up for sale, a Kay Effector electric guitar in excellent condition and in good working order. 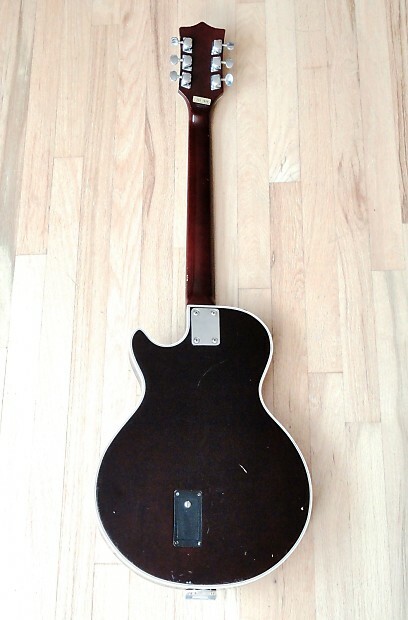 One of the rarer Japanese guitars to find in functional shape, this Kay was produced in the Matsumoku factory and is often seen branded Univox as well. 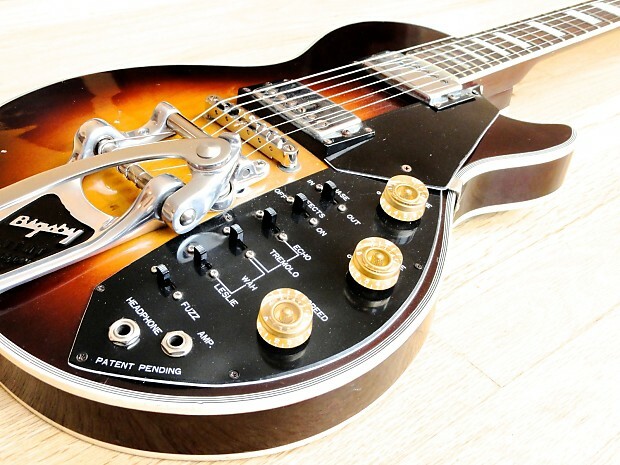 The Effector boasts complex circuitry, and true to it's name, has a host of effects built into the guitar and available via an array of slider switches. 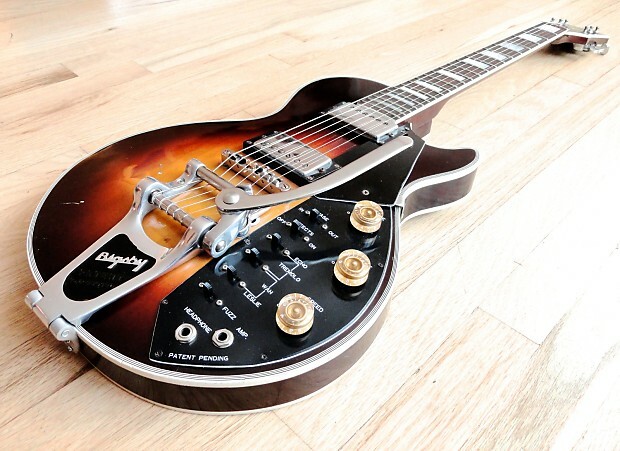 Everything from Fuzz to Echo and Tremolo is at your fingertips with the Effector, and a previous owner also had a Bigsby B7 professionally installed (a $170 value) to further add to the guitar's versatility. 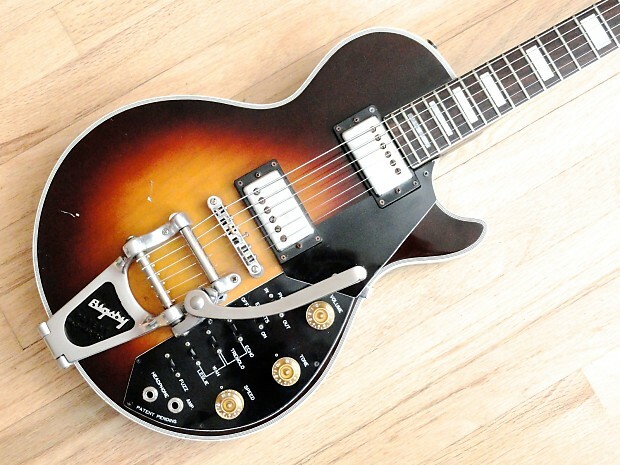 The semi-hollow Les Paul style body is equipped with two humbuckers that have plenty of punch and fullness on their own, but on the Effector, the built-in effects are really the stars of the show. Professionally setup here at Mike & Mike's Guitar Bar, this Kay plays great and sounds, well, however you want! The neck has a medium C profile with a rosewood fretboard, pearloid block inlays and original medium jumbo fretwire. The frets have plenty of height and life left, although you can feel a slight roughness to the strings when bending, due to a previous level and crown where a very fine grit finishing buff was not done. 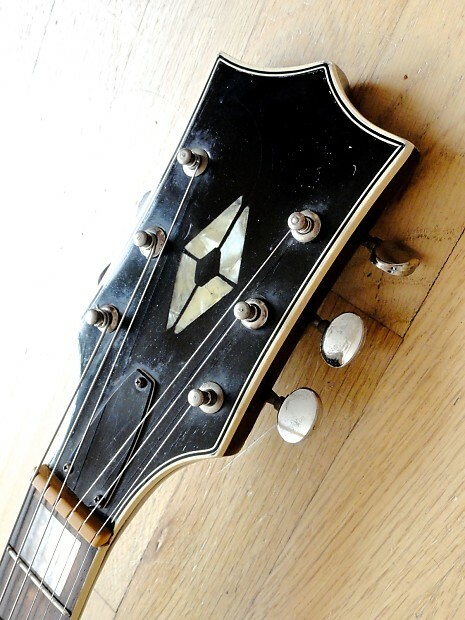 The headstock retains the original tuning machines which still turn smoothly and get the job done. The electronics have been completely gone through and all effects work as they should, although the effect names and combinations sometimes differ from the traditional perception of what you'd expect (echo and tremolo for instance are on the same circuit and provide a similar function). In addition to Volume and Tone knobs, there is also a phase switch for achieving that classic thinned out 'quack,' and also a Speed knob for adjusting the rate of many of the effects. 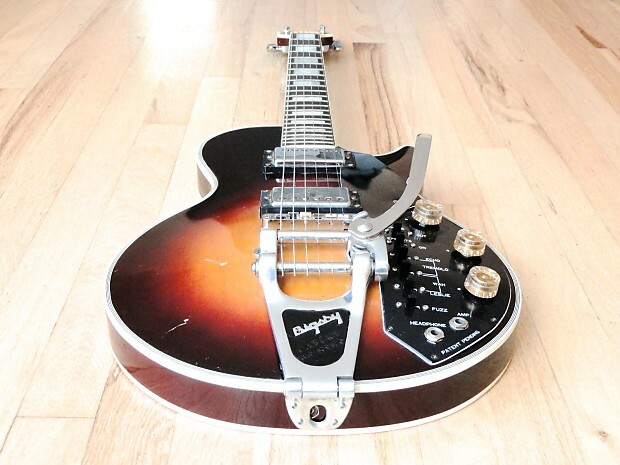 The Bigsby B7 installed on the body is an exceptional piece of USA made hardware, and the spring is very responsive for deep dives and quick warbles. 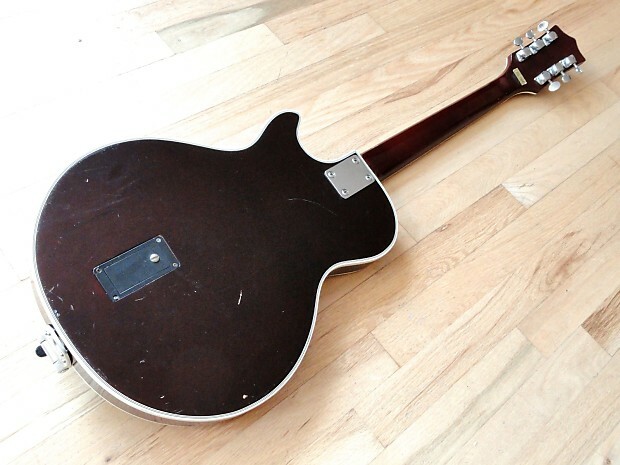 Cosmetically, this guitar is in very good overall condition, with a few small dings and scuffs on the back and also various small, inconsequential nicks on the top and sides, although most are too tiny to properly photograph. 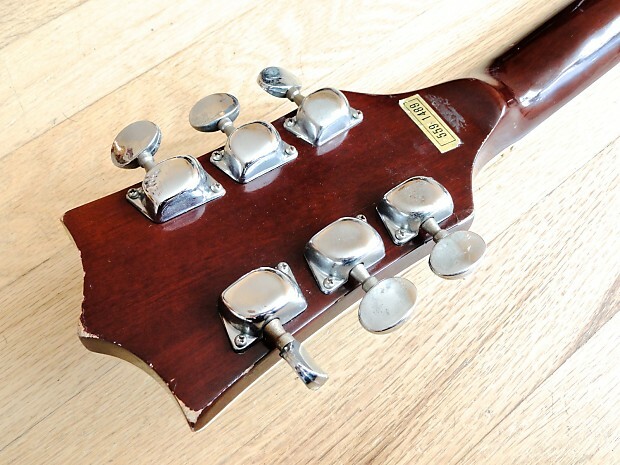 There is modest wear along the edges of the headstock as well. 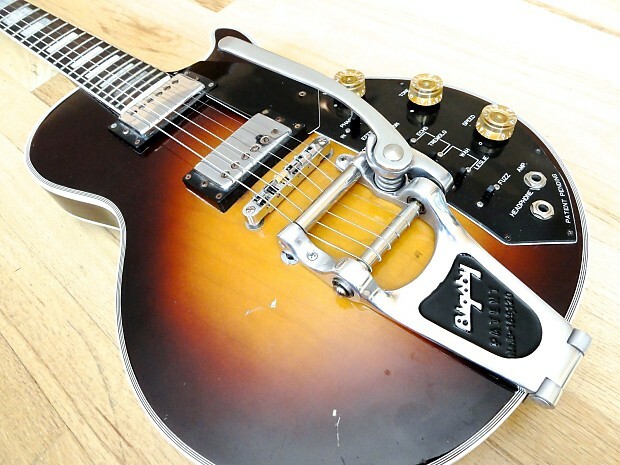 Don't miss out on this rare and functional Kay Effector, manufactured in Japan and upgraded with a Bigsby B7 vibrato! Within the continental USA we ship via FedEx Ground. All shipments are insured through the shipper as well as our shop insurance policy. We are happy to offer worldwide shipping on all items! Please contact us for an accurate international shipping quote before bidding or buying, as cost varies by buyer location. Most guitar shipments outside the USA are via USPS Priority International, and FedEx International Economy is our preferred carrier for amplifiers and shipments that exceed dimensional limits of USPS (these vary by country). International orders will be declared as “merchandise” and the value of merchandise will be declared as the amount paid. We cannot declare anything as a gift or for a lesser value. No exceptions! The customer is responsible for all taxes and duty, which may be collected upon delivery. We use industrial 1/2" bubble wrap as well as 1" hard foam and double walled boxes where applicable to make sure your purchase arrives safely. Strings are detuned, switch tips and endpins packed separately, and all usual precautions taken to ensure that our instruments and amps arrive exactly as described.